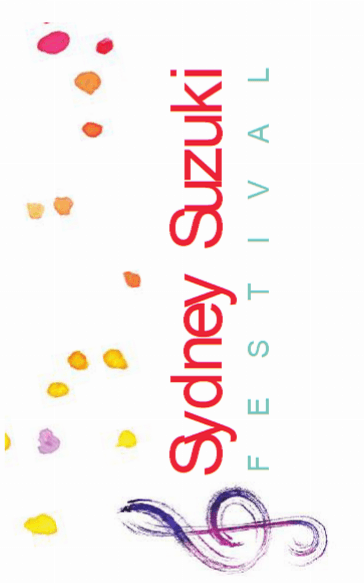 Sydney Suzuki Festival (SSF) for Violin, Cello, Piano, Flute and Guitar students, Early Childhood Program plus Teacher's Professional Development. Fun classes, play-ins and concerts. A great occasion for learning, sharing and making music in an encouraging Suzuki environment. An environment that will help sustain and motivate us to keep moving towards our goals. See also our "Benefits of attending a Suzuki Festival". Enrolment numbers are limited and will be processed in order of receipt. All applications must be members of their local Suzuki Association. A shorter daily program for Junior students, which will consist of a tutorial enrichment class and play-in for string/flute students. All students participating in the Standard Program will work in small group tutorials focusing on developing key points such as tone production, musical expression, technique and posture. Students will also have the opportunity to experience a range of level appropriate classes including ensembles, play-ins, tone & technique classes, repertoire classes and musical enrichment. Senior students will work intensively on a selected work throughout the SSF as part of a varied program of advanced classes. Music will be distributed from Thursday 28 March, 2019. The SECM Festival program (3 days, 13 - 15 April) caters for children aged 0 - 5 years who will be grouped into age appropriate classes. If families wish to enrol siblings in the same class please note this on the enrolment form. The SECM classes are fun, interactive group musical activity classes based on the Suzuki Philosophy. A range of musical and social concepts involving listening, singing, beat, rhythm, pitch, movement, creativity and the playing of percussion instruments provide a memorable experience for the children. For the benefit of your child, please ensure that each child has one carer present to participate with in the class. No previous musical knowledge is required. The SECM program will consist of one 45 minute SECM class each day. All SECM students are welcome to observe all instrumental classes and concerts during the SSF. Participation in instrumental classes involves a separate enrolment. Beautiful performances by individual students or studio groups. Inspirational for students of all ages and levels. is an opportunity to celebrate and reflect on the achievements of students over SSF. Auditions for Concerts are open to all students enrolled in SSF. All audition submissions are due on 24 February, 2019. No auditions will be accepted after this date. To audition select the Audition box on the online enrolment form and pay for it. Audition recordings will be accepted as a YouTube link only, and must be submitted by email sent to admin@suzukimusicnsw.com.au before or on 24 Feb 2019. Only memorised performances will be considered. Only the piece auditioned will be considered for performance. Late, incomplete or incorrect YouTube links will not be considered and fees will not be refunded. Notification of audition results will be via email by 11 March, 2019. Audition Fee are non refundable. The Festival Audition Panel reserve the right to invite outstanding students to perform in the Afternoon Concerts. A series of free lectures designed to support parents in their understanding and application of Dr Suzuki's Philosophy. Enrolment numbers are limited and will be processed in order of receipt. The Professional Development Program will include lectures and classes with the SSF International Guest tutors, as well as observation of the Festival classes and daily teacher tonalisation classes. For more information go to the Event Page. To participate in the SSF, you must be a current member of your local Suzuki Association. Please complete your SSF enrolment online. You will receive an email confirmation of your registration and receipt for payment immediately. An information email will be sent by 8 April, 2019. We are unable to accept multiple instrument applications. A parent or carer must be in attendance at the SSF at all times. No responsibility will be taken by the Suzuki Talent Education Association of Australia (NSW) Ltd for children or students left unattended. Your enrolment in the SSF indicates your acceptance of our Terms & Conditions and Risk Policy. After 1 February, 2019 - a late fee of $80 per application. Late enrolments will only be accepted if positions are available in appropriate classes. You will be notified within ten (10) working days. All cancellations must be received in writing. Cancellations received by 13 March 2019 will be refunded less $70 Cancellation Fee. No refunds will be made after this date. Note: Timetables subject to change without notice and Suzuki Office reserves the right to make any alterations should the need arise.